We took some downtime to meet The Wellscene founder Iris Louwerens, who shared her fun fitness secrets with us! We sat down with Sanderson London's resident fitness guru Jamie Baird to find out how to stay fit and healthy into the New Year. At The Wellscene, they do things differently. They turn off the light, crank up the music and bend to the beat. It’s sweat dripping feel-good yoga. We sat down with the woman who started it all, founder Iris Louwerens, who shares her secrets for healthy living, and why exercising with a twist is so much better! 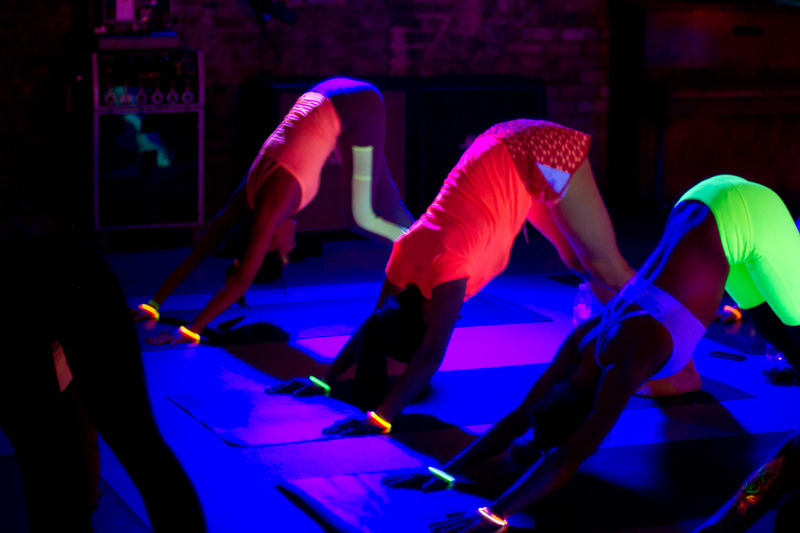 Find out more about our first Flow in the Dark yoga class at St Martins Lane London here. Spaces are on a first come, first served basis, so be sure to book your place! Can you give us a brief introduction to The Wellscene? What inspired you to start the business? In a nutshell, The Wellscene is a healthy lifestyle brand. We organise pop-up yoga and fitness events in London with the aim to make it sociable and fun – more like an alternative to going dinner or drinks. You still get the same benefits of working out or taking a regular class, but you can still come and have a great time with friends. I decided to launch The Wellscene when I was on holiday in Australia about four years ago. I love how people over there integrate being active into their social lives – hiking, surfing with friends etc. Back then, in London, being active and exercising was something that was a bit more solitary – you would work out alone, running, or in the gym for example. I tried to find a form of sociable exercise when I came back to London but noticed there was a real gap in the market and decided to create something myself – the rest is history! I didn’t even see it as a business at first; I love organising events and I love fitness, so I was looking at it more for fun, no business plan or anything, we just ran with it! Initially I started The Wellscene with a friend who is a yoga teacher, which was really convenient. I had already left my corporate job and was focussing on my life coaching business, and so I had enough time to focus on it and give it some love - amazingly it just took off so quickly! I got lucky at the right time and in the right place. Can you tell us about your personal healthy living journey? When did you become interested in yoga, HIIT training and so on? I’ve always had a natural interest in living healthily and being active, I was very sporty when I was younger. The healthy eating side of things came a little later when I was at university as I because very aware of what I was putting into my body. When I started my first few real jobs I got more into spinning and so on, and then there was a time when I was working in a job that I really didn’t enjoy. I started using exercise as more of an escape – running and yoga really helped me to relax and de-stress; that’s when I really connected with the power of exercise and realised what an important part of life it is. I’ve found that exercise is a really amazing mindfulness tool. It’s a great escape from the outside world and really helps to let of any excess tension, and to relieve stress. As long as you are actually mindful about what you are doing – exercise could quickly become an addiction with so many endorphins pumping in your body! I really believe in the importance of moderation – be mindful of why you’re exercising and what your actual goal is. With The Wellscene, what’s great is that if you come with or make new friends, you can turn it into part of your lifestyle and integrate exercise into your social life. What are your overall goals for The Wellscene? What do you hope to achieve from it, and what do you hope for it to inspire in others? I feel that the company is still so young – we’ve only really been running for two years! There’s so many ways that it can go. One route that I want to take is to do more collaborations with other brands, but to step it up a little more – working with high-quality, upmarket venues, and venues that are more unique. At the moment we usually host our own events in Maida Vale, but we’d love to be able to tour our events around London a lot more, so that we can reach new people and different kinds of audiences. 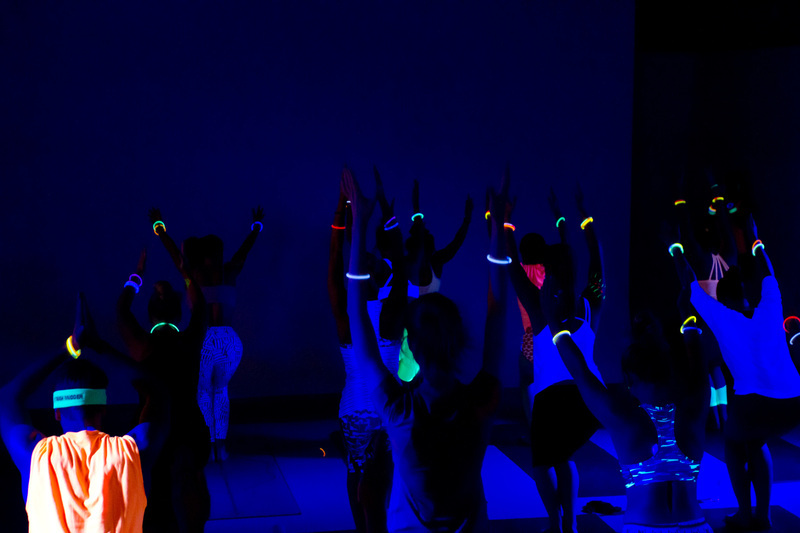 For now, our main focus is going to be on our black light events - Flow in the Dark and Black Light Burpees. 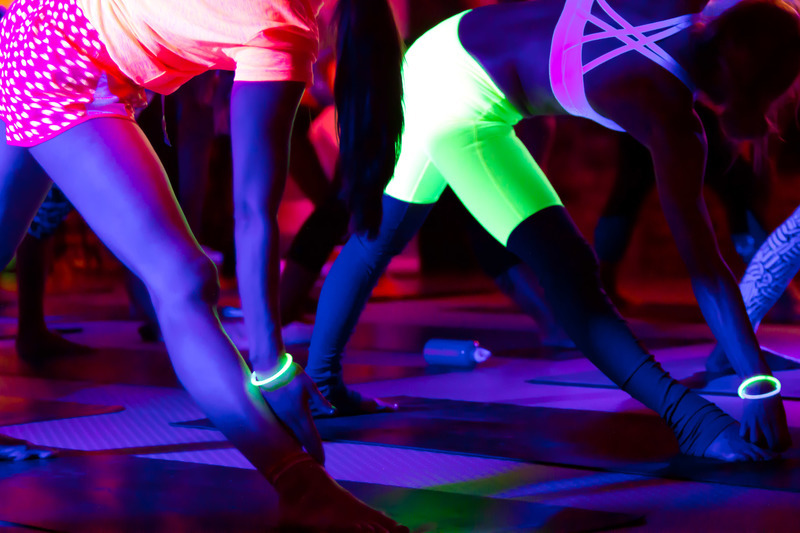 I’d love to eventually open a studio that’s purpose-created for black lights, which inverts the idea of the more traditional ‘calming’ yoga, and makes it more into a night-time almost ‘clubby’ atmosphere with loud music and high energy. It’s still the same quality of yoga and teaching, but it creates a different experience for people to practice their yoga. There’s plenty of places that apply this to spinning, HIIT training and boxing, but you don’t really have that with yoga. I always wonder if more people would try yoga if it was less traditional – people have a preconception that it’s a lot of breathing and a lot of chanting, but it doesn’t have to be to achieve the same physical results. It would be great to get people into a class that still leaves them with the benefits of yoga, but in an atmosphere that more suits them. What are the most common misconceptions about yoga and low-impact exercises? I think the biggest thing is that people thing it’s just about meditation and stretching the body – not really having any more impact on the body. People seem to think if you don’t sweat massively when you exercise that it’s not worth it, but even if you don’t break a huge sweat it’s still great for toning your body, strengthening your body and for your overall being. It’s not about the ‘go hard or go home’ mentality that other forms of exercise have, but it’s still a great way to condition your body, and reach a goal. What does The Wellscene offer in terms of classes and atmosphere that other fitness brands don’t? At the events we host ourselves, we always take people to secret locations. We give a rough idea of which area it will take place, but we don’t spill the beans until 3 days before. It builds a bit of mystery and creates a bit of excitement and anticipation – it makes the whole thing more of an event rather than just ‘I’m going to a gym class’. The other thing that we try to do is make the whole experience more sociable. After classes we encourage people to stick around and have a drink with their friends – to see it less as a fitness class and more as part of an evening out. Lots of people come with friends, but it’s also a great place to come alone and mix and mingle with other like-minded people. We’ve had plenty of people come alone who have made regular friends from attending our classes, which is so great to see! What advice can you give to people who are trying to live a healthier lifestyle – exercise, balanced eating etc? What is the best way to stay balanced and not stray from one extreme to the other? 1. Find a form of exercise that suits you as a person – a workout that works best for you and your goals, as well as how to fit it into your spare time. If, for example, HIIT training isn’t enjoyable for you and you dread going to class, then it’s not right for you no matter what the physical benefits. If you enjoy doing something, you’ll be more inclined to keep at it, work harder and, most importantly enjoy it – all the while seeing the benefits! What are the successes and struggles that you’ve experienced and faced since you started The Wellscene? A very good question! The biggest struggle was the first year we launched. We started our events in the summer, holding all of our events outside, and getting relatively low numbers, which meant that come winter we found it really hard to find the right size venues for winter. Having to scale events to work all year round was really tricky – not being able to hire venues regularly and not breaking even for some events was very difficult, but we had to ensure not to see it as defeat and actually as just one of the things that comes with being a young company. We made sure to just drive the business and focus in raising awareness rather than how much money we had coming in. Something else that is also difficult is that I’m now running the whole operation on my own – I’m a one-woman band! There is so much to do so I have to make sure I’m always prioritising my time, and always have to evaluate what’s worth investing my time in. At the moment one of my key priorities is learning new skills that will help me further develop the business, like SEO. One of the biggest successes to come from The Wellscene is definitely our Flow in the Dark classes. We started them in October 2015 and it’s the only event that we’ve been running constantly since, that keeps growing and gaining more interest from people. To see one event go from strength to strength and even to have regulars who keep coming back is so rewarding! The support we also get from big brands that want to work with us is also amazing. We’ve never really had a negative response from the people we reach out to; it’s so flattering and humbling when people say they want to collaborate with us, and I’m so grateful for that. Don't forget to follow The Wellscene on Instagram!